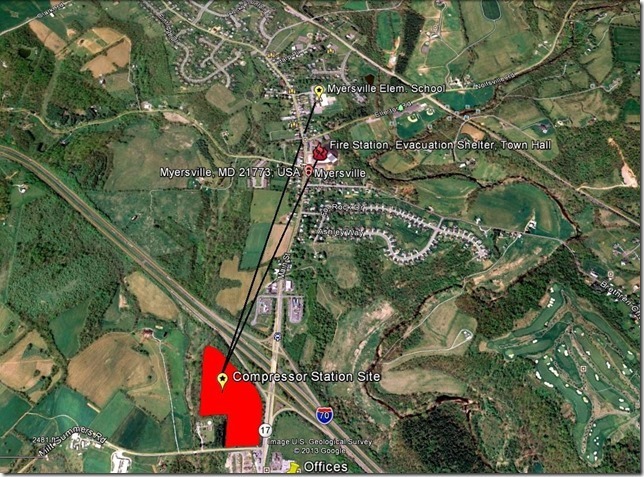 The map shows the location of the proposed 16,000 hp compressor station in Myersville in relation to the town’s elementary school and the evacuation center at the fire station.//Information provided by Myersville resident Ann Nau. Mighty Myersville should have caved by now. Facing a Dominion Transmission Inc. (DTI) lawsuit, an order from the Federal Energy Regulatory Commission (FERC) and a huge stack of documents, this rural town of about 1,600 could have been expected to back off, resigned and chastened, to await its compressor station. But Myersville residents march on. To industry, they are the ants disturbing the picnic of abundant fracked natural gas that Dominion and company plan to lay out for the country. And so, industry is hauling out the DDT. Last month, the Interstate Natural Gas Association of America (INGAA), whose members (including TransCanada Corp.) operate 200,000 miles of pipelines, piled on. It filed a friend of the court brief in Dominion’s January lawsuit against Robert Summers, head of the state Department of the Environment (MDE). Myersville Citizens for a Rural Community (MCRC) joined that suit as an intervener. That case will be heard May 14 in the U.S. Court of Appeals in Washington. In a separate suit in January, Dominion also sued the town, Town Council and mayor. MCRC and the town also have asked FERC for a rehearing. As INGAA indicates in its friend of the court filing, FERC “routinely issues” certificates for compressor stations, which, come to think of it, it did in this case as well. In INGAA’s view, if towns can thwart a compressor station, they will soon be stopping other fracking infrastructure, such as pipelines and plants for liquefied natural gas (LNG). Myersville residents and elected officials have refused to cave, and the state Department of the Environment is backing them up. A bit of background on Myersville: After scaring several other towns, Dominion finally settled on Myersville for the 16,000-horsepower compressor station that would pressurize natural gas as it passes through pipelines from fracking sites in Pennsylvania to homes and businesses in the mid-Atlantic and Northeast (and perhaps beyond. More on that later). After several hearings in Myersville, and at the urging of MCRC, the mayor and Town Council decided in August that amending the local Comprehensive Plan to allow the compressor station was not in the best interests of the town. The compressor station would be a health and safety hazard to residents, town officials decided. Furthermore, Myersville already doesn’t meet federal and state air quality standards, and this would only make matters worse. FERC decided otherwise and in December issued a permit for the compressor station. FERC went so far as to conclude that the compressor station would benefit the town. But even with the FERC certification, Dominion needed an air quality permit from the state. Secretary Summers, however, said his Department of the Environment couldn’t issue that permit unless Dominion had the required local zoning, which it doesn’t. Dominion maintains that FERC’s order and the federal Natural Gas Act preempt local regulations and the Clean Air Act. Myersville officials, its residents and the state disagree. Hence the lawsuits. INGAA and Dominion’s court filings reveal exactly what is at stake. Dominion says compressor stations are needed in Ohio, West Virginia, Pennsylvania, and Maryland to keep gas flowing. Dominion says it will “suffer irreparable harm” if it can’t construct the Myersville compressor station. 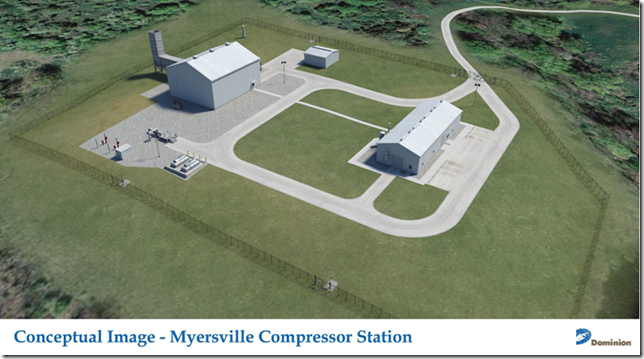 It even claims that the harm from the compressor station to the town of Myersville is less than the harm Dominion will feel if it can’t build the facility. INGAA also sees a bigger picture behind this Myersville nuisance. Myersville and MDE’s success in stopping this project “would mean, in effect, that a single town can veto a $112 million, FERC-approved, interstate pipeline project spanning three states” and “would provide a blueprint for every other Maryland municipality that wants to block a pipeline project and, by extension, for every other state.” INGAA notes in its filing that from 2000 to 2012, the amount of gas pipeline placed in service increased an average of 1,300 miles per year. Its members, who construct all this pipeline, would have to “take the added risks of a municipality-triggered state veto into consideration in planning and proposing new projects.” Whereas now, industry and FERC can ride roughshod over any town. Coincidentally—or not—Dominion has filed an application (weighing in at 12,000 pages) with FERC to expand its Cove Point LNG facility in Lusby, Md., so that it can export all this fracked natural gas to Japan and India. Indeed, one of MCRC’s arguments with FERC is that the proposed Myersville station is oversized—because the town is being in sucked into Dominion’s plans to send excess capacity to Cove Point. Myersville has a very different view about this compressor station. It is concerned about noise as well as air pollution from volatile organic compounds, nitrous oxide and formaldehyde. It has also compiled a list of accidents in the last couple of years at compressor stations, some of which required evacuation of residents within 1.5- or 2-mile radius. The entire town of Myersville is within two miles of the proposed station, including the evacuation center at the fire department (one mile) and the elementary school (one mile). The surrounding area is farmland, state parks and some historic sites. Myersville is defending its master plan in the suit. But MCRC is also taking on the entire FERC system. “The FERC scoping session is absolutely ludicrous and puts the onus on the local citizens to oppose a multibillion-dollar company and a governmental agency with no oversight,” according to MCRC secretary Ted Cady. Dominion can do endless hours of research to counter any local points. It submitted 1,000 pages of information to FERC, including 12 resource reports, appendix, and other material, Cady said. Under the FERC process, residents, with no background in the subject, then have to review, understand, submit comments. In an arrangement that pits communities against each other, Myersville was also expected to provide alternatives. “They must educate themselves on the complexity of the industry and its impacts to air/water/land permitting, cultural concerns such as registered historic sites and … environmental concerns such as the Endangered Species Act, geologic fault analysis, noise safety, air dispersion analysis, etc.,” Cady wrote in a letter about the suits. In its court filing, MCRC says INGAA and Dominion are exaggerating the doom scenario—i.e., that all towns will rise up against FERC. The courts will rule on Myersville’s unique circumstances. But towns such as Dryden and Syracuse, NY, Pittsburgh and Highland, PA, and many others are saying no to fracking, and Minisink, NY, is still fighting a compressor station there, even as construction moves ahead. Residents in Longmont, CO, call their action a “citizen uprising.” Myersville is joining in. A computerized image of how the compressor station will look. Dominion has offered to paint it to look like a barn.//Image provided by Ann Nau.